1.Let me start with the product I am most excited about – the Revlon Colorstay foundation! I have been eyeing this stuff for absolute ages and I finally caved and got it! I immediately had to try it and I am in-love!! The shade I got is 150 Buff, which is just the perfect match for my skin tone (MAC NW 20 for reference). The foundation is really easy to apply, it doesn’t cake or flake on my face and it seriously stays on all day! I love it! 6. Speaking of Ingrid, last summer she was raving about this Sally Hansen Airbrushed Legs spray. I made a mental note that I want to try it and it since the wormer months are just around the corner (or at least that’s what I keep saying to myself lol) I decided to go for it! Now, as I’ve mentioned a bazillion times I am super pale and I always need a little help in the tan department so I think this product would be very useful to have for when I want to dress up a little bit and look my best! Also, this product really helps to hide any imperfections that you may have on your legs (freckles, scars, veins etc.) and is supposed to make your legs look flawless! :) We’ll see about that but I will most certainly let you know what I think of this stuff as soon as I try it! Let’s just hope that it will be soon cuz I want my warm weather!! Now! Please? Revlon Colourstay is one of my faves. Oldie but a goodie. Thank you dear! <3 I love Revlon a lot atm, too! :)) I want to try out their lipstains! This is one awesome beauty haul!! So many amazing products, love the Nivea lip butter and the pretty nail shades. Please let us know how the airbrushed leg spray works. Nice haul :)I follow you!do you want to follow each other? I love your beauty haul! Aww I'm so happy you do! <33 Definitely try them cuz I am seriously loving them at the moment! :)) You won't regret it! I'd love to try the lip butter from Nivea! They seem really nice according to everyone on the internet hahaha! :D Nice haul! Oh wow you sure hit all the popular products that I've been wanting to try! I just hauled a Nivea lip butter too. :) (http://ahemitsemme.blogspot.com/2013/03/tuesday-morning-and-cvs-haul.html) Please do reviews on the revlon colorstay foundation, the nivea lip butters (I enjoy knowing what other people beside myself think too :) ), the Sally Hansen airbrushed legs, and the rocket mascara! thank you so much! 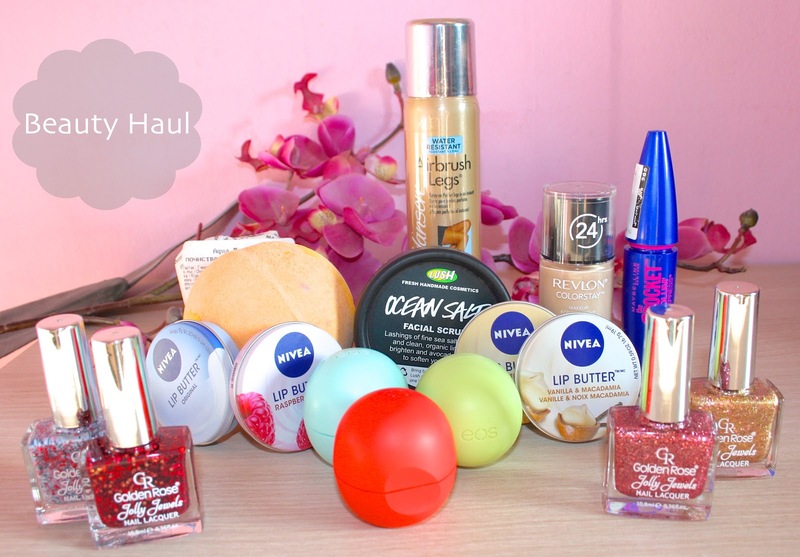 love this beauty haul :) Would you like to follow each other? I like your new layout. So pink and cute!! I need to check out EOS lip balms sometime! The only thing is that I also want to finish up what I have before using new ones, haha! All the more reason to keep my lips moisturized. Really great haul! I want to try EOS! I love reading and watching hauls, lovely post! I love it, too! They are one of my favorite types of posts! :)) And thanks a lot dear! I'm always looking for a good foundation, so thank you for the review! Oh wow lots of goodies! I love Golden Rose collection! Lush is great but very pricey! Also for foundation to stay on Nivea Hydration primer is meant to be really good too- but combinging it with the actual faoundation like you got sounds better ahaha! Love the haul makes me wanna go out and shop! Aww thank you so much dear! Means a lot! <33 And I love your blog so much! Oooh, I love glitter polishes - the red looks so yummy! I reviewed Ocean Salt a few weeks ago after buying the smaller tub and yesterday I had to buy the bigger one from Lush! it's so gorgeous and gentle on the skin i adore it! I think that Revlon have come out with some amazing products recently hope you enjoy them. Your blog is one of the nicest I have seen! 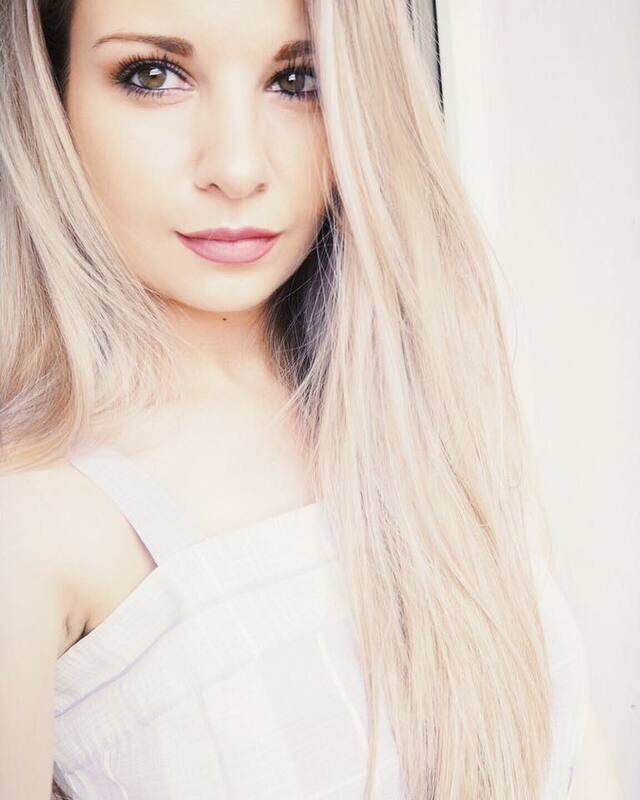 So pretty and girly :) Your pictures are so professional too! I really want to try the Sally Hanson airbrush legs it looks amazing! you got a nice blog!Would love to follow each other! Ouuu great favourites! :) I am dying to try Ocean Salt from Lush! Aww, thank you so much! That means a lot to me :) I love Ocean Salt! It works wonderfully! Those nail polishes look so pretty! Would love to try the revlon colorstay foundation! Muchas gracias por tu comentario en mi blog!!! Tienes un blog muy original, personal y fantastico. Such a good beauty post :) love it! Thanks for having commented on my blog! I'm following you now! I find your posts very interesting! Hope you follow back! I just followed you and would really appreciate it if you could follow me back please! If any of you have a few secs would you please check out my blog! Willing to do the same for any of you too. Hello darling! What a great review! Love those lip balms! What a haul! love the leg spray! Seriously, I have dry skin and revlon's foundation is the only one that works for me. Sometimes, the drugstore stuff is the best. Anyway, great blog, would you like to follow each other? Rosy I love this post! I'm in love with all these products!!!! I want them! Thank you for the comment on my blog and great post! Wow ! You bought so many things ! I think your design is really cute !